The inspiration to paint a beautiful sunset could be quashed when muddy colours seem to come from nowhere and bright colours look garish. An oil painting intended to portray intense colours of a dramatic sunset looks more like a post apocalyptic scene. How can the artist recreate the drama of a sunset in painting? Trying to make a sunset look dazzling by using exclusively bright colours in a painting, such as pinks, mauves and oranges, resulting in a candyfloss and childlike portrayal of dusk. Placing dark colours of sunset prior to the pales, causing contamination of the bright colours by the neighbouring dark colours. Allowing two contrasting colours, such as violet and yellow or blue and orange, to overlap on the painting, resulting in muddy streaks across the sky. Making generalisations about how sunsets should look, such as the gradations of colours when receding from the sun. This is often portrayed as yellow to orange, orange to red, red to mauve and mauve to blue. Using black to darken a bright colour, such as red or orange. Miscalculating the tonal values of a sunset scene in favour of the colour by making the assumption that blue is always darker than red, or yellow is always paler than mauve. Portraying the landscape at the horizon as a cardboard cut-out black silhouette. 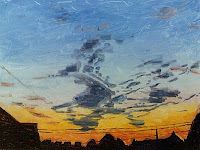 This video clip shows how I painted a dramatic sunset in alla prima. Due to contrasting colours, I had to be careful not to let one contaminate the other. Dramatic sunsets often contain bizarre colours and tones (as can be seen in the video). In such cases, it is important to believe what the eye sees, and to resist toning down the colours, or to try to make the colours make sense. The following practices will help when painting sunsets. Even the brightest sunsets contain sullen colours and neutrals. Without this contrast, the sunset would not appear so bright. Furthermore, apparently bright colours often consist of dark mixes. A blood red sky can be achieved by a mixture of permanent rose and burnt umber; bright orange often contains a hint of violet. Keen observation of tiny colour shifts in sunsets is the key to making it look convincing. Sunsets are often more about tone than colour. Half closing the eyes will break down the scene into basic tonal areas. Bear in mind that any colour can be darker or paler than another: yellow can be darker than blue; violet can be paler than red. It is worth remembering that sunsets often invert the tonal values of a daytime sky, where clouds generally appear paler than the blue sky. At dusk, clouds will appear almost inky black against a bright sunset. Apply the pale or bright colour mixes prior to the darks. This will prevent colour contamination of the bright colours. Bin the black. Use a contrasting colour when darkening a colour. Red, for instance, can be darkened by the introduction of a little blue; yellow can be darkened with a little violet. Look out for textures in sunset skies, such as the oblique sunlight skimming across the undersides of altocumulus or altostratus. Look for different types of outlines in clouds, where some will be softer than others. Cirrus, for instance, has feathery outlines; distant anvil clouds often have defined outlines. Smooth areas of a sunset sky, such as the night sky between the clouds can be recreated by glazing the oil paint. This entails thinning the paint into a smooth even layer with a little linseed oil. Textures in the clouds can be recreated with thicker paint or impasto which will contrast with the smooth areas. A diversity of outlines can be created by blending misty clouds with a clean soft sable, and defining sharp clouds with a fine brush. Look for diverse darks on the foreground landscape. Some will appear warmer than others. Some may have violets, others, smoky blue. Again, nearer objects will often have sharper edges than distant objects. This will help give the silhouetted landscape depth. My video clip showing how I painted mists over the canyon might be of interest (apologies for the loss of detail on the sky half-way through, this is due to high contrast in the painting). nice post you have ..keep it up...love it..